WARNING! If you read on, you’ll have no more bad hair days!!! They laughed when I told ‘em I could find Authentic Hawaiian Floral Hair Clips without the cost of the plane ticket. Ready to add mesmerizing style for every special occasion? Want a complete look without spending $45 or 45 minutes? Make your hair sparkle with beautiful floral Hawaiian Hair Clips!!! Hmm, take a deep breath in… do you know what that is? 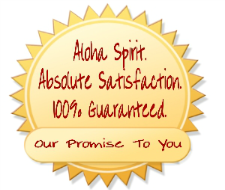 It’s the smell of Aloha – relief from the stress and frustration you’ve been feeling every time you have to “do your hair” – whether it’s to go out for a special occasion or just wanting to look “nice” even if you’re not going anywhere special. Women of fashion: What the magazines told you was wrong! They’ve been keeping the biggest fashion secrets from you. Making a great fashion is not just about clothes, make up and shoes. Hairstyle is critical in having a gorgeous look. A woman's hair is part of her allure. A crown of lustrous, beautiful hair can make even ordinary appearance stand out and is a thing of pride for its owner. To add up extra spark and glitz to your hairstyle, add some floral Hawaiian hair clips to your accessories. Even a small hair clip can bring a great difference. It adds up a catchy touch and gives more definition to your style. It can save what may have started off as a bad hair day into the gift of a great hair day – a day where everyone is complimenting you on your hair, your style, and the radiating glow you exude from your confidence knowing….! Hair styles seem to change almost as often as the wind so it's hard sometimes to keep track and be current. It is imperative for you to look at your best because it is your moment. This is for you to stay as beautiful as possible and stand out among the crowd. Deciding on styles and accessories is as important as on the clothes you are going to wear. But if you do not, and like most women have just about a passable thickness, a manageable length and style, then these Hawaiian clips can considerably help to enhance your look while hiding its flaws. You’re in a rush, late for work again….Your date/hubby is pacing waiting for you be ready to go to that important event. You don’t have 45 minutes to spend on your hair. It just won’t cooperate! You think “I’ll just throw it up and hope for the best” but you know it isn’t going to look good – and it will show not only with your hair – but in you – as you’re just not that bright bubbly person everyone knows and adores. Hawaiian hair clips to the rescue!!! Transform the messiest hairstyle into looking like you’re on the cover of the latest fashion magazine. Heads will turn….and in a good way. So easy to use – in minutes your look is transformed. You look in the mirror, smile and say…..
Oh God! I am the center of Attraction! Even the most beautiful hair style can't grab attention these days. There are many cool things that visually compete with it. During your mum's time a good head of hair and a good style would be all that it took. Today to attract attention, it's a unique idea to accessorize your hair with our flowery hair clips. It doesn't matter whether or not your hair alone is pretty. Your pretty hair needs more to be attractive. Unattractive hair needs the help that our cute flower hair clips can bring. Wait! Wait! I want something fun….something summery…..something different. Ah! We’ve got you covered!? If you're looking for a new look and you might be worried about choosing an appropriate stylish floral hair clip, then there is one thing you should remember. You have to hold one vital point in mind and that is you and your new hair clip need to go together well. Our fashionable hair clips can make a huge difference to your personality. A pricy wardrobe with accessories and makeup turns waste if your floral Hair clip is not as elegant as they are. Our stunning range of floral hair clips speaks and adds to your personality; in fact it sometimes reflects your adorable character! So flash your signature style – look like an A-list celebrity. Selena Gomez, Jennifer Aniston, and Sarah Jessica Parker are all women of fashion who found the perfect accessory: floral Hawaiian hair clips! If you like to go for simple accessories, try wearing a floral bobby pin or a pony tail holder. These are ideal for people who have long hair and like to tie them up in a bun. These amazing flowery clips can also be used to tie your hair in a low pony tail. If you want to be more adventurous, wear a big flower in a bright tropical color to accentuate your outfit and/or make you feel more feminine. When it comes to our floral Hawaiian hair clips, there are countless styles available. This is why you can never really have enough hair clips. There are hair clips in every Hawaiian flower including Plumeria, Hibiscus, and Orchid. There are hair clips in every tropical color including pink, turquoise, lavender and yellow. There are flower hair clips in every kind of clip: barrette, bobby pin, pony tail, comb. The combinations are endless. Fast Shipping! Thank you for the quick turnaround. I got it in 2 days – right from Hawaii! Service With a Smile! The customer service is FANTASTIC! They helped me find the perfect hair clip. Love My Look! Mahalo! I’m getting compliments all the time on my “new look” (something as simple as a Hawaiian hair clip made people take notice). When it comes to our floral Hawaiian hair clips, there are countless styles available. This is why you can never really have enough hair clips. There are hair clips in every Hawaiian flower including Plumeria, Hibiscus, and Orchid. There are hair clips in every tropical color including pink, turquoise, lavender and yellow. There are hair clips in every kind of clip: barrette, bobby pin, pony tail, comb. The combinations are endless. Yup! These Hair Clips don’t make a HOLE in your WALLET! Instead of using more expensive accessories that are riddled with expensive stones, our flower Hawaiian floral hair clips are more inclined towards economical options. For about $5 you can literally transform your look. You’ll be stunning and stylish in today’s hottest fashion accessory. Plentiful and affordable, cute, trendy flower hair clips line the store shelves, enticing your gaze and captivating your inner fashionista. You can be whoever you want to be, just by switching to our trendy collection of hair clips. Ladies, no more secrets. The fashion magazines have been keeping the biggest fashion secrets from you. No more! Our elegant flower Hair Clips provide an interesting spark to any outfit. Little girls to women of all ages adore these cute clips. Choices range from small traditional everyday styles to more daring and unique choices. These perfect add-ons take full credit for imparting a dramatic and striking effect to your ensemble. Our sparkly clips, bow hair bands, hair flowers and headbands are very popular. From small and plain to glamorous and extravagant, our cool hair clips often make huge fashion statements. Wearing your beautiful flower hair clip even when at the beach shows how well you want to keep your good look and by doing so, you can certainly make heads turn your way. So if you feel you are having a bad hair day, think of our amazing floral Hawaiian hair clips and in an instant turn it into a positive one. Surely, any girl who is into any kind of hair fixing would have already tried using different kinds of hair clips because they are very useful in so many ways. Have you observed how flowers have become a trend that flower hair clips are so much into hair fashion? Grab these beautiful flower Hawaiian Hair clips NOW!